Grease a 6-8 inch diameter pan with 1 tbsp oil. Place yufka (Turkish Phyllo Dough) inside the pan leaving the 4-5 inches of the edges outside (see the picture). In a bowl, mix milk, egg and ¼ cup canola oil. Apply crumbled cheese and parsley/dill (optional) over the yufka evenly. Then, pour the liquid mixture and fold the edges inside to close up (see the picture). Turn the heat to medium and cook the borek till it gets golden brown. Then, cook the other side as well. 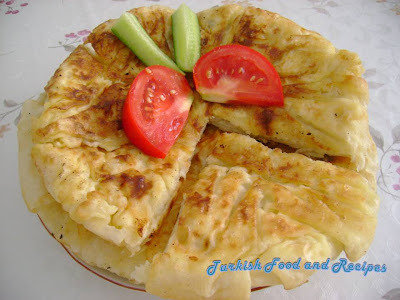 Once both sides are cooked take the Pan Cooked Borek to a serving plate and cut it into slices like pizza. Serve warm. 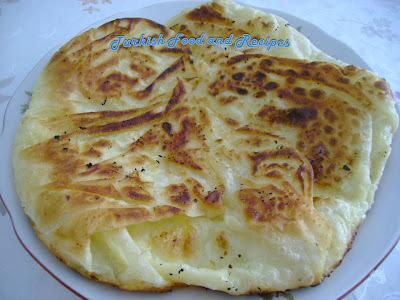 Pan Cooked Borek is a very delicious alternative for breakfasts and brunches. Genisce bir tavanin dibini 1 yemek kasigi yag ile yaglayin. Icine yufkayi disariya kenarlardan bir karis tasacak sekilde yerlestirin (resime bakiniz). Bir kasede sut, yumurta ve yagi karistirin. Tavadaki yufkanin uzerine; peynir ve maydanoz/dere otu (istege bagli)nu esit olarak dagitin. Sonra, sutlu karisimi dokun ve disarda kalan yufkanin kenarlarini tavanin icine dogru kapatin (resime bakiniz). Tavayi ocaga yerlestirin ve orta ateste kizarana dek pisirin. Sonra spatula yardimi ile ters cevirin ve diger tarafini da kizartin. Her iki tarafi da kizardiktan sonra servis tabagina alin ve pizza dilimi seklinde dilimleyin. Tava Boregi kahvalti ve cay saatleri icin cok guzel bir alternatiftir. Eline sağlık görüntüsü okadar güzelki üşenmedim gittim yufka alıp yaptım şu andada afiyetle yiyorum çok güzel oldu. I haven't tried this with phyllo dough, however I often use phyllo dough for my regular boreks. So, I would give it a try! I tried it once at my Turkish friend's house. It is so delicious and looks quite simple. Thank you for your recipe.